New York Yankees first-year manager Aaron Boone knew his team’s most powerful slugger needed a pep talk. On Tuesday night, after the Yankees rallied to defeat the Houston Astros, Boone became a motivator when he spoke to Giancarlo Stanton. Boone wanted to calm the nerves of Stanton who had just played a second consecutive game in which he suffered three strikeouts. Boone told Stanton that the Yankees power hitter that he would be carrying the rest of his teammates when they were struggling at some point during the season. That is just what took place the very next game. On Wednesday, New York won its 11th game in its last 12 played with Stanton providing all the runs the team needed to beat the Astros 4-0. Stanton hit two home runs and had an RBI double knocking in all four of his team’s runs on the night. After the game, Stanton said it was nice hearing what Boone had to say to him the previous night and that he knows he needs to be patient since the season is very long. Stanton’s start with the Yankees has seen more down days than up ones. His strikeouts and a low rate of production have dominated his season to date. For example, prior to his two-home runs and a double on Wednesday, Stanton’s previous two games read 0-for-8 and six strikeouts. However, flashes of his enormous power at the plate that he showcased last season with the Marlins, when he won the MVP award after leading the majors with 59 home runs, gives fans the hope he will bust out in a big way. 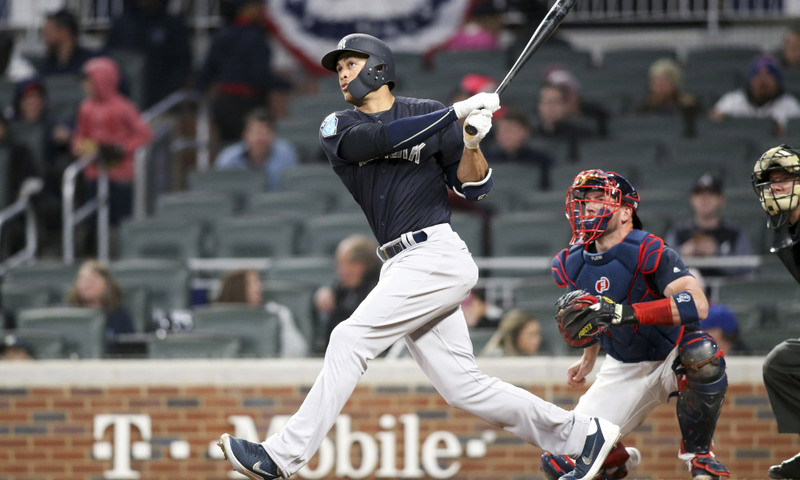 Thus far after 30 games, Stanton has seven home runs and 19 RBIs that equate to a full 162-game season of 38 home runs and 103 RBIs, which by most standards is a very productive season, but because he put up 59 home runs last season, fans do not want to see anything less from their high-priced slugger. New York fans have booed him loudly due to the number of strikeouts he has had. In 30 games, Stanton has 47 strikeouts. Even though he had three hits on Wednesday including a pair of home runs he struck out once as well. Stanton says one strong game at the plate is not what he wants. He wants to have breakout weeks not just breakout games.